Des Reed played 200+ games for Fremantle CBC Amateur Football Club. He was a captain/coach in 1956-1958, 1961-1962, 1964 and 1970. He was a triple premiership player in the WAFL for South Fremantle in 1952, 1953 and 1954. 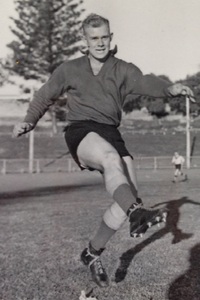 Des was the inaugural premiership coach of the Fremantle CBC league side in 1961 and was made a life member of the club in the same year. Des served on the committee from 1960-1970. Des was included in the Fremantle CBC 1960’s Team of the Decade and was a Hall of Fame Inductee of the club in 2010. Des Reed is inducted into the WAAFL Hall of Champions as a High Achiever.